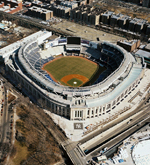 Turner provided construction management services for the construction of the New York Yankees new 50,800-seat, 1.3M s.f. major league baseball stadium, located one block north of the original stadium in the Bronx, New York. The building is a steel-framed, architectural pre-cast walled structure. The exterior pre-cast façade replicates the original Yankee Stadium and includes a replica of the copper frieze that lined the inner wall of the original Yankee Stadium. Turner also provided construction management services for the restaurants, lounges, dining areas and concession stands. The facilities will include a Hard Rock Café and NYYSteak, a 6,300 s.f. steakhouse that will be open year-round to ticket holders and the public. Additionally, a large food court near centerfield will accommodate fans from more than 5,000 bleacher seats. Turner worked with Cisco to ensure the stadium’s Food & Beverage program is well equipped with the necessary telecommunications infrastructure to support the required technology needed by current vendors and future growth. Fans will be able to watch the game from anywhere in the stadium, including from concession stands and even the restrooms. The stadium includes locker rooms, showers, physical therapy rooms, exercise and fitness rooms and instructional areas. Each player’s locker has Internet hookup and is fully wired with television and other audio visual capabilities. The physical therapy space has a whirlpool, endless pool, sauna, steam room, message room and a medical care center. The training areas include a weight room and batting and pitching cages. The instructional space includes a coaches training room with video training. The stadium also includes laundry facilities, a family room with a nursery, equipment rooms and press room for interviews. 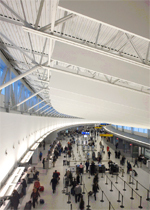 Turner provided construction management services for the JetBlue Terminal 5 Project at John F. Kennedy Airport. The project consisted of a 640,000 s.f., 26-gate terminal addition that incorporates the landmark TWA terminal, designed by Eero Saarinen in 1962. This project more than doubles the airline's JFK capacity to 250 daily flights with a capacity for 20,000,000 customers per year. The Terminal structure is comprised of 640,000 s.f., 10-line explosion detection machines, 20-lane TSA security check area, baggage conveyor system, and a large expanse ticket hall, market place and baggage hall. The plan also included a connecting bridge to the AirTrain station, a parking garage with 1,500 spaces and the connecting tubes to Terminal 5, where JetBlue provides electronic ticket kiosks for passengers who want to walk through the historic structure. Turner was not only responsible for the Terminal structure, but also the civil works, including all arrival and departure roadways, storm drainage and retention systems, airside apron demolition and installation, site utility installation and relocation, and hydrant fuel and valve systems. This is a post-9/11 design that not only accommodates the latest security requirements but also creates an enjoyable and humane experience for passengers. Also included is a 70-acre tract to accommodate additional planes, increasing service into and out of New York. Turner completed all construction without disrupting the airline’s daily operations. 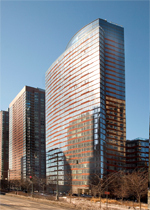 Turner provided construction management services for one of New York City’s “green” residential towers, the third green project for Turner in Battery Park City. The Visionaire is located between First and Second Place and Battery Place and Little West Street. The 35-story building on a 20,000 s.f. site encompasses 423,200 s.f. total of which 40,000 s.f. 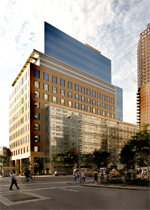 is dedicated to the new headquarters for the Battery Park City Parks Conservancy and 4,000 s.f. is for retail space. The Visionaire incorporates "green" building technologies including centrally-filtered water, an in-building wastewater treatment system that re-supplies toilets and central air-conditioning makeup water, a 10,000-gallon cistern for storing rainwater, roof gardens, floor-to-ceiling windows, insulated glass and terra cotta exterior, photovoltaic panels, harvested wood floors, bamboo cabinetry and low VOC paints, adhesives and sealants. This building was among the first to qualify for the U.S. Green Building Council’s highest standard for Leadership in Energy and Environmental Design (Platinum LEED). This building yields 35% more energy savings than code-compliance buildings and will compensate approximately 5% of its electric load through building integrated solar panels and 35% from wind generated power. Amenities of the building will include an indoor pool, fitness center and spa, rooftop gardens with built-in grills, screening lounge with dining area, children’s playroom and onsite parking. Turner is providing construction management services for this 17-story high, 239,000 s.f. building. The building’s exterior wall is comprised of a mix of precast brick and stone panels, aluminum and glass curtainwall with metal panel in-fills at various locations and laid-in masonry wall. The building has MER’s at the basement, 11th floor and 16th floor levels. These MER’s contain five air-handling units that vary from 9,000 to 92,000 cfm, two 600-ton chillers, a two-cell 1,400-ton cooling tower and 600KW emergency generator. The building’s main use will be for various types of imaging equipment to diagnose breast and other types of cancer. There will be three 3.0 Tesla MRI’s, two PET/CT scanners, two VCT scanners, a stereotactic machine, one general X-Ray room and ten Mammography machines. In addition to the imaging suites, there are also chemotherapy treatment rooms, pharmacies, clean rooms, administrative areas and five shell floors for future expansion. 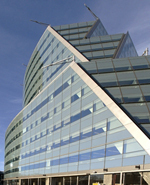 Turner provided construction management services for this Citigroup office building that consolidates its central New York Business Units. The facility sits across the street from One Court Square, the 48-story tower that Citigroup along with Turner built in 1989. The first phase of the project consisted of a 15-story mid-rise office tower of approximately 490,000 s.f. which forms a podium above which the Phase 2 tower rises. A single basement level will houses all the major mechanical equipment as well as building management/operations spaces. Amenities include a training center and 300-person auditorium on the second and third floor levels, mail and messenger center, 120-person dining facility with full-service kitchen and a centralized CER/Data Center. The project has been identified as a LEED “Silver” compliant building. In addition to constructing Phase 1, Citigroup funded an upgrade of the local subway connection to accommodate the large influx of passengers to the area created by this project. The subway station improvements, outside the building property line (just south of Court Square), include an enclosed connection of the above grade (No. 7) subway line and the below grade (G) subway line. This enclosure enables passengers to walk underground between those lines, rather than having to walk outside as previously necessary. The Court Square station is only one subway stop from Citigroup’s Manhattan Headquarters. Turner provided construction management services for the 46-story Crowne Plaza Hotel at Times Square. The renovation consisted of two distinct phases and began with the hotel’s infrastructure, including an upgrade of the electrical system, HVAC system, and water main service waterproofing in the building’s garage. 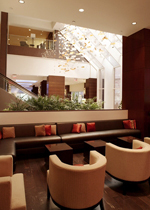 The second phase of the project was an aesthetic upgrade of the hotel’s rooms and lobby.